Join Jungle Jim on his quest through the rainforest in search of great riches in this excellent title from veteran slot designers Microgaming. The Jungle Jim El Dorado game offers players some interesting special features and has a great art style to boot. You might feel like you’ve gotten lost in the thick of the rainforest for real! The action takes place over a standard modern video slot machine grid (5×3). Players are also treated to a free spin mode and a couple of bonuses that use a collapsing reel style feature. Massive return-to-player rating. We love playing games rated 97% or above! Great special features that can soon become incredibly lucrative. Nice artwork and animation throughout. This creates a game that has an appropriate feel for the subject matter – jungle adventures! Feebly low main game prizes. These are made up for with the generous bonus features but those who like spinning in mega jackpots might find Jungle Jim El Dorado a little unexciting. Low upper betting limit and few options to distribute wagers. Treasure Chest = 120x the total bet. Totem Pole = 40x the total bet. Dragon Relic = 20x the total bet. Ancient Flute = 8x the total bet. “Scatter” = 5x the total bet. This makes the biggest prize available to players an impressive 92,000. Landing three or more “Scatter” symbols anywhere on the reels will trigger the free spin mode. 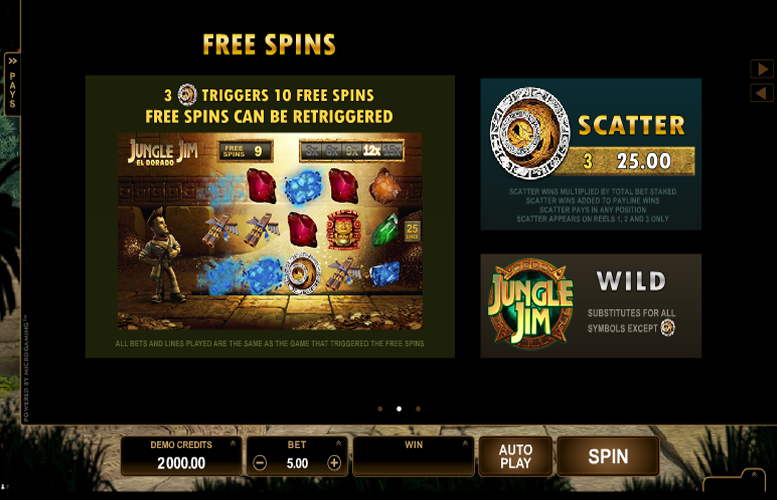 Players are awarded 10 free spins. These can be retriggered during the mode by landing an additional three “Scatter” symbols on the grid. Every winning spin will trigger the Rolling Reels feature. During this game mode, all winning symbols will disappear, leaving gaps that symbols from above will drop down into. This can trigger additional wins. What’s more, the Rolling Reels feature applies to both the base game and the free spins mode. Although the main game prizes are a little on the unimpressive side on the Jungle Jim El Dorado slot machine, the Multiplier Trail more than makes up for their inadequacies. 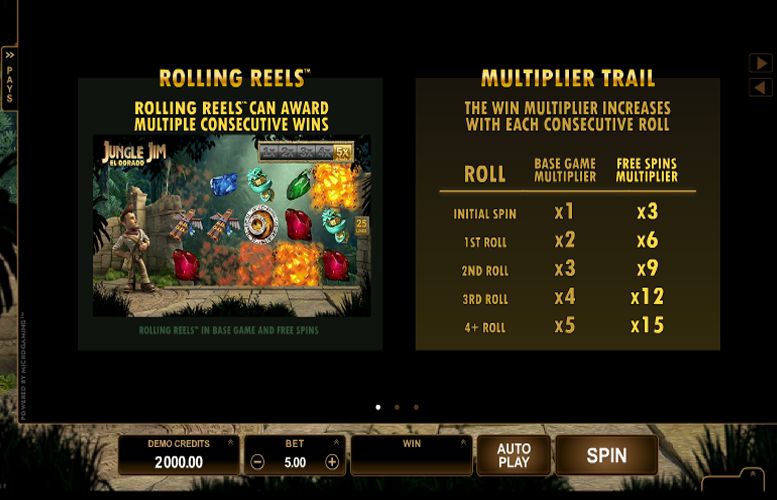 Each winning spin of the Rolling Reels has a different multiplier attached to it. The more consecutive rolls a player receives, the higher the total multiplier awarded. What’s more, the multipliers are even higher during the free spin mode! Initial Spin = 1x multiplier in base game, 3x multiplier during free spins. First roll = 2x multiplier in base game, 6x multiplier during free spins. Second roll = 3x multiplier in base game, 9x multiplier during free spins. Third roll = 4x multiplier in base game, 12x multiplier during free spins. Fourth roll onwards = 5x multiplier in base game, 15x multiplier during free spins. Red or Orange Gem = 4x the total bet. Green or Blue Gem = 2x the total bet. Although players cannot change either the number of win lines or the amount bet on each one, they do have plenty of options to vary their bet sizes. These go up in 25p increments from the minimum bet of 25p up to a maximum of £25. 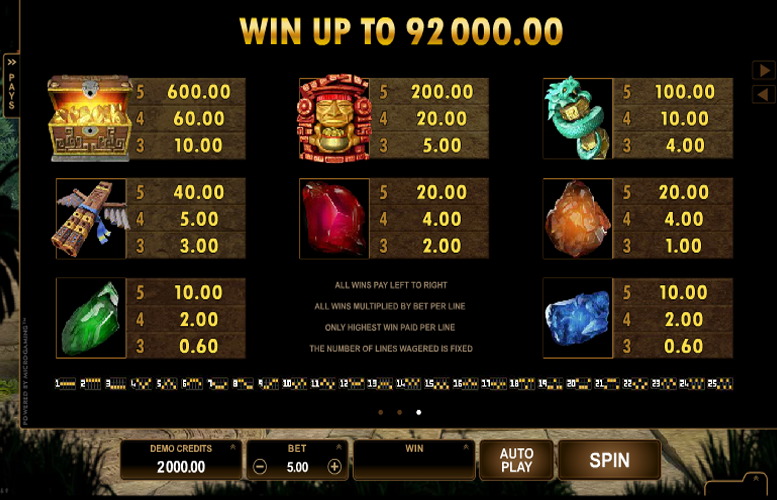 Whilst there are plenty of options to mix up the size of the bet, the lack of choice when it comes to distributing wagers, plus the low maximum bet will likely put some players off the Jungle Jim El Dorado slot machine. 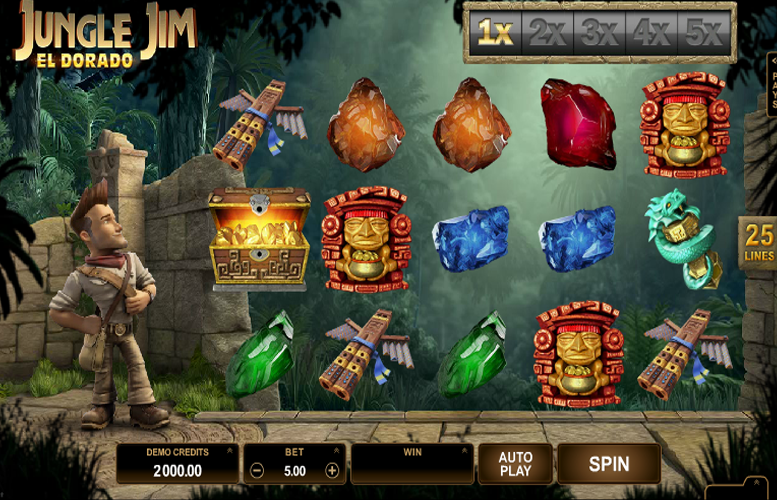 The Jungle Jim El Dorado slot machine is a solid title with a lot going for it. The artwork and animation are great, the bonuses keep the action exciting, and the prizes, despite being on the low side, can soon add up thanks to the multiplier Rolling Reels feature. Unfortunately, the low main game prizes and the rather miniscule upper betting limit let this one down. However, if you’re a fan of games in which all the real money is made during bonus features and don’t mind playing some small ball on your slots, it might just be your new favourite game!